Here are some snazzy birthday facts about 23rd of September 1946 that no one tells you about. Don’t wait a minute longer and jump in using the content links below. Average read time of 9 minutes. Enjoy! What day was my birthday Sep 23, 1946? September 23, 1946 was a Monday and it was the 266th day of the year 1946. It was the 38th Monday of that year. The next time you can reuse your old 1946 calendar will be in 2019. Both calendars will be exactly the same! This is assuming you are not interested in the dates for Easter and other irregular holidays that are based on a lunisolar calendar. There are 154 days left before your next birthday. You will be 73 years old when that day comes. There have been 26,509 days from the day you were born up to today. If you’ve been sleeping 8 hours daily since birth, then you have slept a total of 8,836 days or 24.19 years. You spent 33% of your life sleeping. Since night and day always follow each other, there were precisely 898 full moons after you were born up to this day. How many of them did you see? The next full moon that you can see will be on May 18 at 21:13:00 GMT – Saturday. Fun stat: Your first one billion seconds (1,000,000,000) happened sometime on June 1, 1978. If a dog named Shablu - a Wirehaired Pointing Griffon breed, was born on the same date as you then it will be 344 dog years old today. A dog’s first human year is equal to 15 dog years. Dogs age differently depending on breed and size. When you reach the age of 6 Shablu will be 42 dog years old. From that point forward a medium-sized dog like Shablu will age 4.5 dog years for every human year. Astronomers Urbain Jean Joseph Le Verrier, John Couch Adams and Johann Gottfried Galle collaborate on the discovery of Neptune. Nintendo Koppai (Later Nintendo Company, Limited) is founded by Fusajiro Yamauchi to produce and market the playing card game Hanafuda. The Phantom of the Opera (original title: Le Fantôme de l'Opéra), a novel by French writer Gaston Leroux, is first published as a serialization in Le Gaulois. World War II: The Nazi puppet state the Italian Social Republic is founded. Korean War: The Battle of Hill 282: The first US friendly-fire incident on British military personnel since World War II occurs. Gerrie Coetzee of South Africa becomes the first African boxing world heavyweight champion. José Canseco of the Oakland Athletics becomes the first member of the 40–40 club. Kauhajoki school shooting: Matti Saari kills ten people before committing suicide. What does my birthday September 23, 1946 mean? 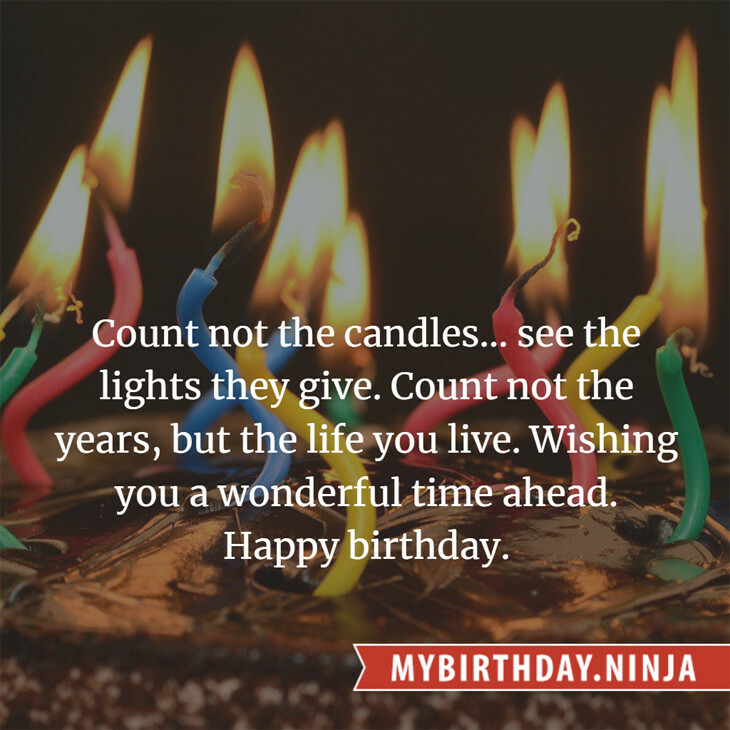 Your birthday numbers 9, 23, and 1946 reveal that your Life Path number is 7. It represents analysis, awareness and understanding. You are the searcher and the seeker of the truth. The following celebrities also have the same life path number: Le1f, Sid Haig, Yo Hitoto, Kathryn Grayson, Ariela Massotti, Zohar Argov, Anita Morris, Little Eva, Bex Taylor-Klaus, Skin. 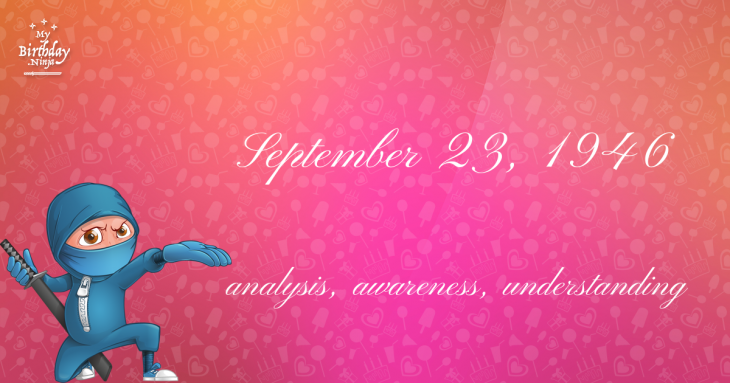 What is the birthday horoscope for Sep 23, 1946? The Western zodiac or sun sign of a person born on September 23 is Virgo ♍ (The Maiden) – a mutable sign with Earth as Western element. The ruling planet is Mercury – the planet of communication. According to the ancient art of Chinese astrology (or Eastern zodiac), Dog is the mythical animal and Fire is the Eastern element of a person born on September 23, 1946. Fun fact: The birth flower for 23rd September 1946 is Aster for memory. What is the Love Match for Sep 23, 1946? When it comes to love and relationship, you are most compatible with a person born on November 11, 1971. You have a Love Match compatibility score of +139. Imagine being in love with your soul mate. On the negative side, you are most incompatible with a person born on March 13, 1938. Your incompatibility score is -152. You’ll be like a cat and a dog on a love-hate relationship. Arf-arf, I want to bite you. Meow-meow, stay away from me! What is the popular baby name on 23 Sep 1946? Here’s a quick list of all the fun birthday facts about September 23, 1946. Celebrities, famous birthdays, historical events, and past life were excluded. Try another birth date of someone you know or try the birthday of these celebrities: December 8, 1950 – Dan Hartman, American singer-songwriter and producer (Edgar Winter Group) (d. 1994); January 26, 1905 – Charles Lane, American actor and singer (d. 2007); August 5, 1948 – Carole Laure, Canadian actress and singer.